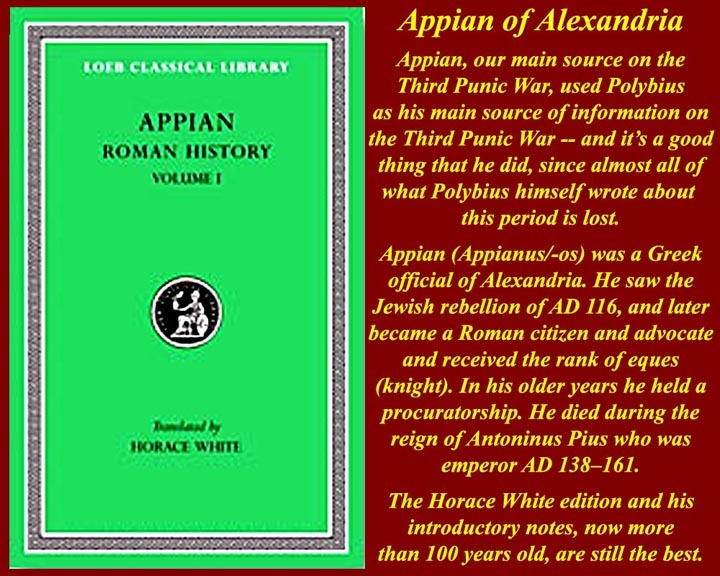 Appian based his history of the war on the mostly lost text of Polybius. Pr- and anti-war factions developed in Rome in the inter-war years. 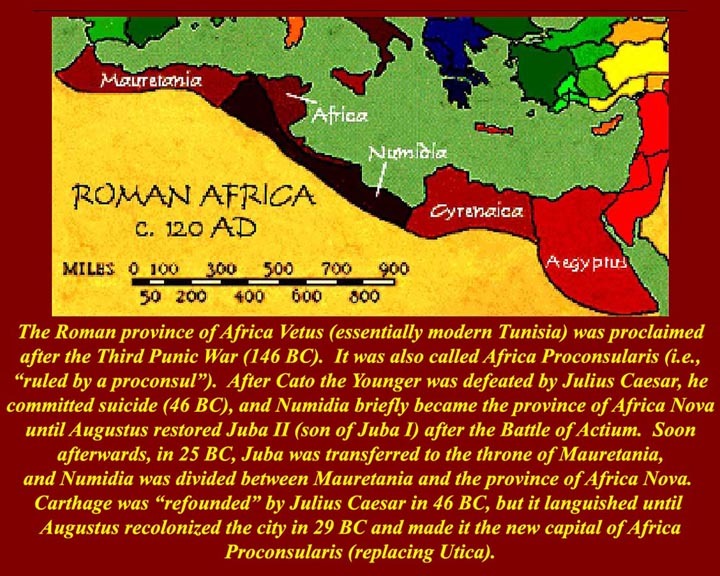 Similar factions grew in Carthage where a small faction also developed that favored an new Numidian (Masinissa) monarchy. Between the Second and Third Punic wars, Roman control over Iberia slackened and revolts followed. 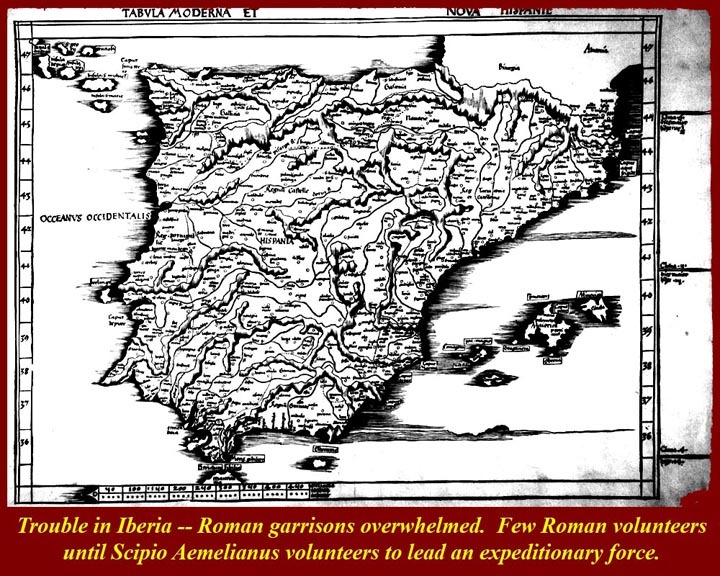 Most Romans wouldn't volunteer for Iberian military duty -- until Scipio Aemilainus joined up. 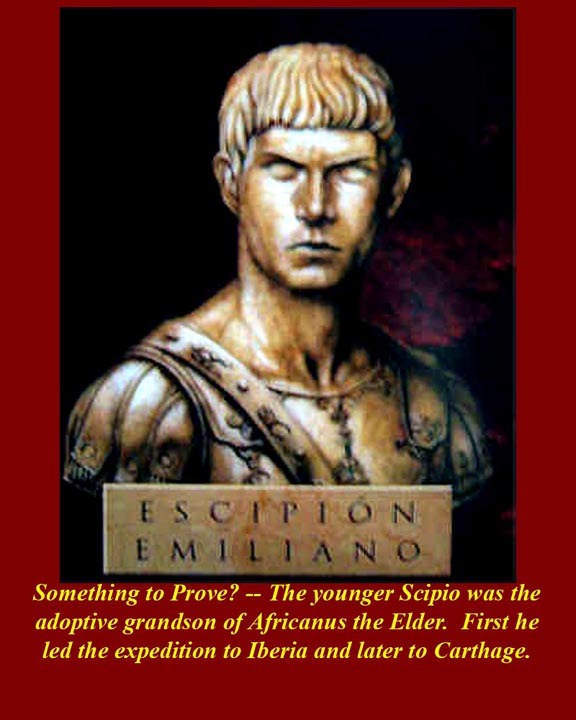 Scipio Aemilianus, an adoptive grandson of Africanus, was the new star of the faction that thought war with Carthage was not necessary. 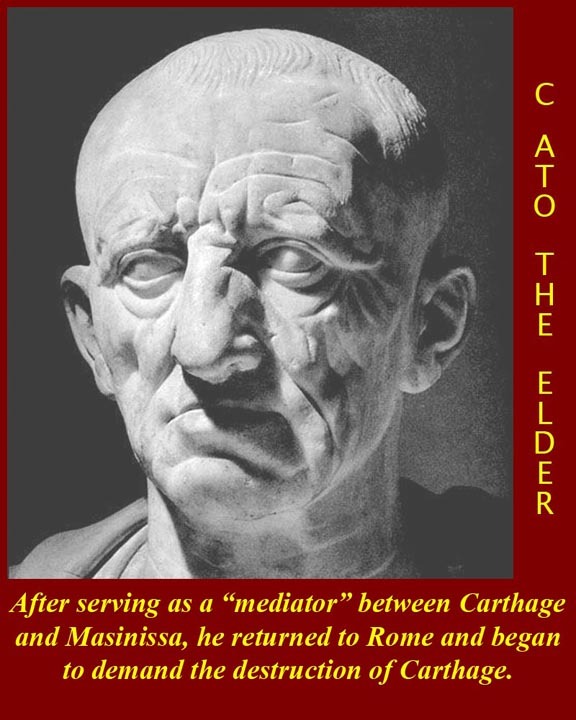 Cato the Elder, a veteran of the Second Punic War, was the iplacable foe of the Scipios and led the Roman faction that said war with Carthage was necessary for Rome's long term existence. 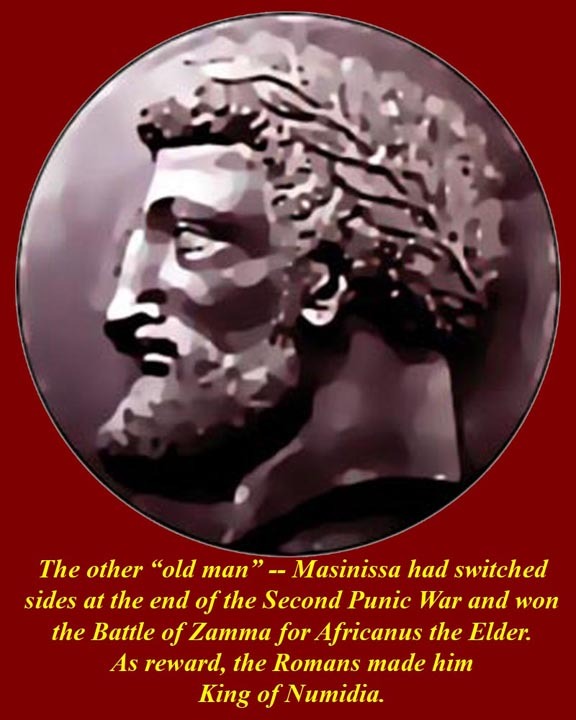 Masinissa, with tacit support of Rome, ate away at the edges of Carthaginian territory and led cavalry raids well into his 80s. 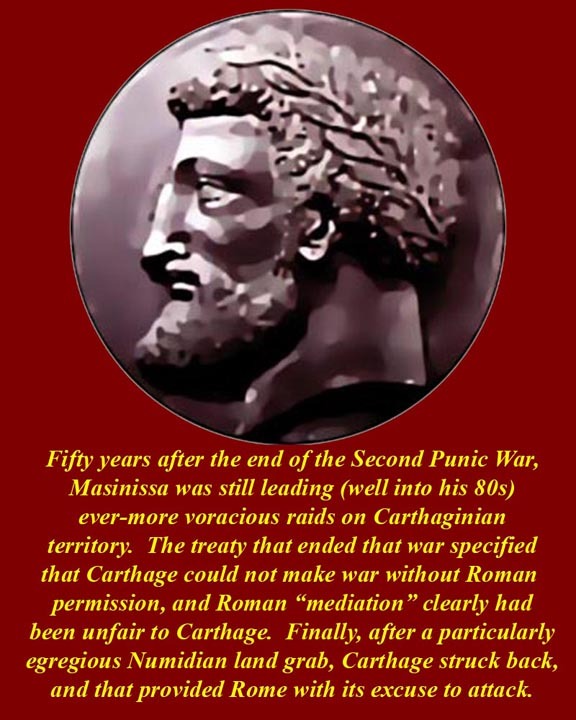 Roman permission -- to one of Masinissas seizures. The pretext may have been a real part of the cause. 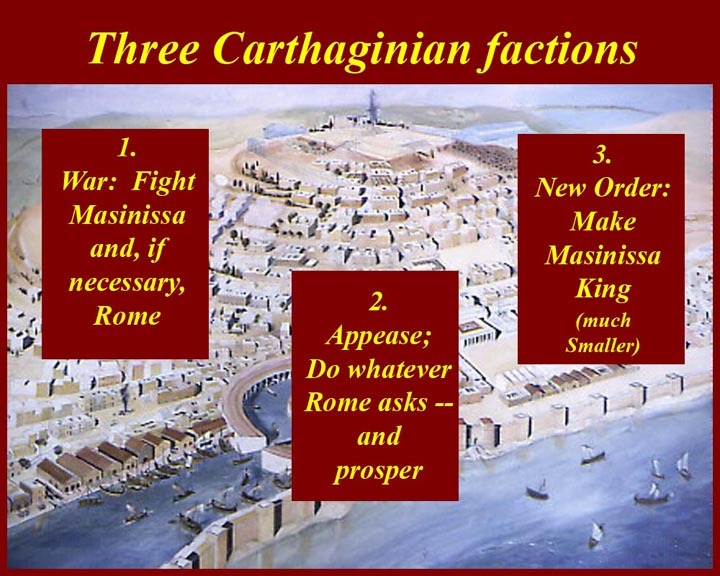 Although Polybius says Rome had decided on war long before the Carthaginian army marched out to fight Masinissa (the Carthaginians lost), it suddenly had been proved that Carthage could quickly put a big army, equal to several Roman legions, in the field. 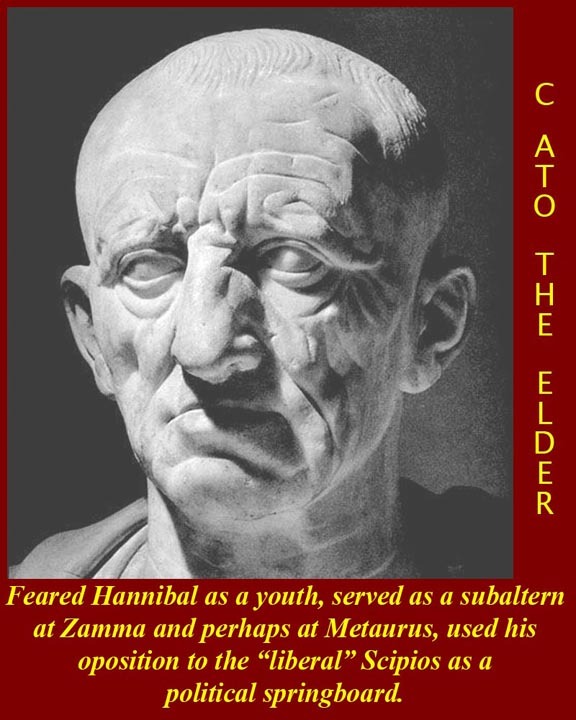 Historians from Polybius until today have cast Cato as the villian of the piece, but, as we shall see, his misgivings about Carthaginian intentions were justified. His fears of the cult of personality exemplified by the Scipios in theid dealing with the Roman army were also prophetic. 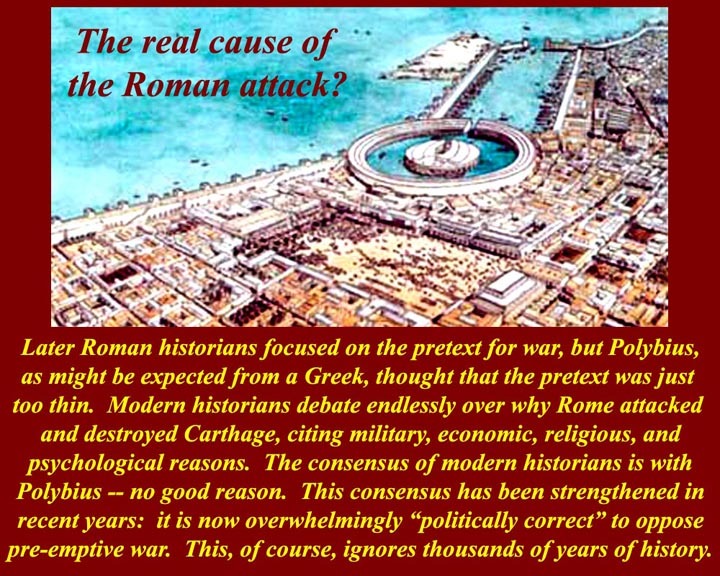 The anti-war appeasement faction took over the city as soon as Rome announce the existence of a state of renewed war (actually resumption of hostilities of the Second Punic War). They agreed to hand over sons of 200 prominent families as hostages, and also turned over "all" their weapons and armor. Appeasement, as could be expected, whetted the Roman appetite. 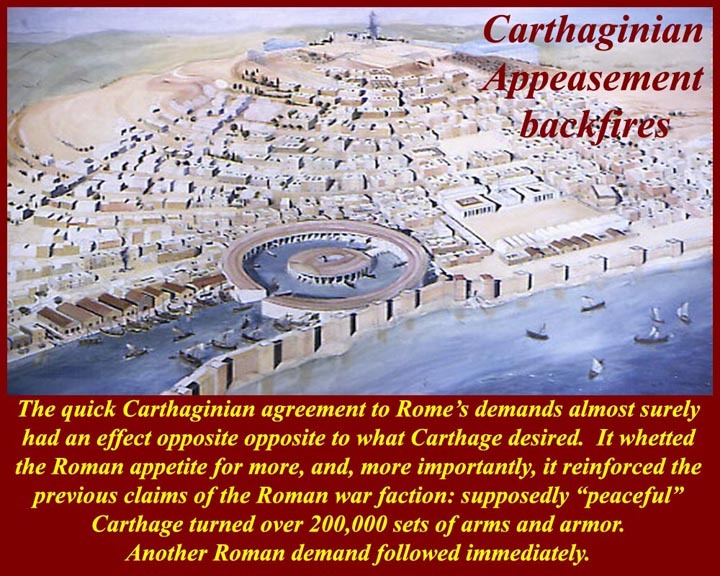 In addition, the turnover of enough weaponry to equip 200,000 troops ratified the claims of the Roman pro-war faction that Carthage was preparing for war. 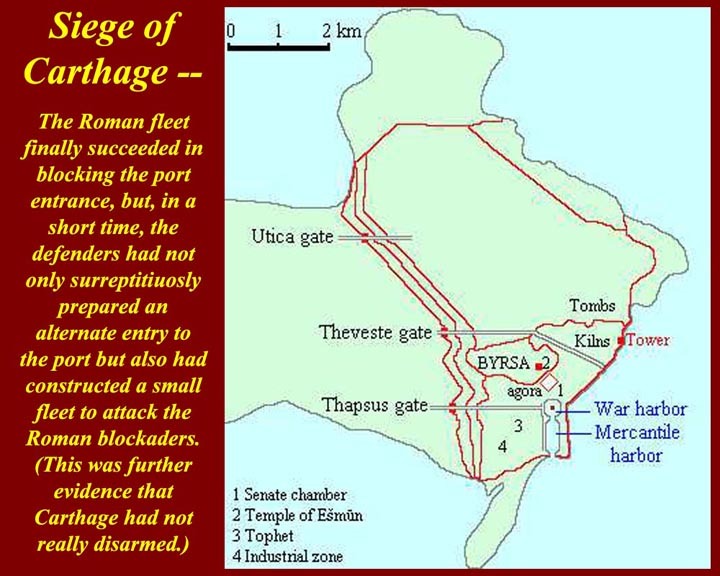 Utica again stabbed Carthage in the back by abjectly surrendering to Rome. 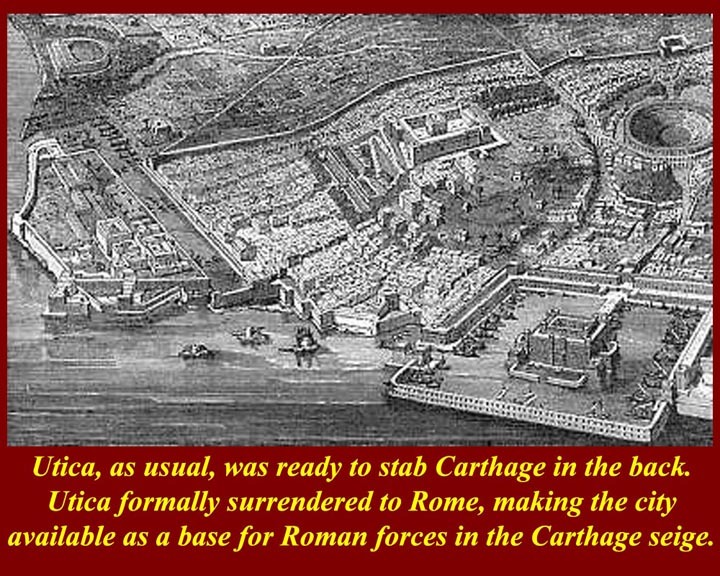 Utica thereby became the base for the Roman expeditionary Consular armies. Romes final ultimatum was rejected. 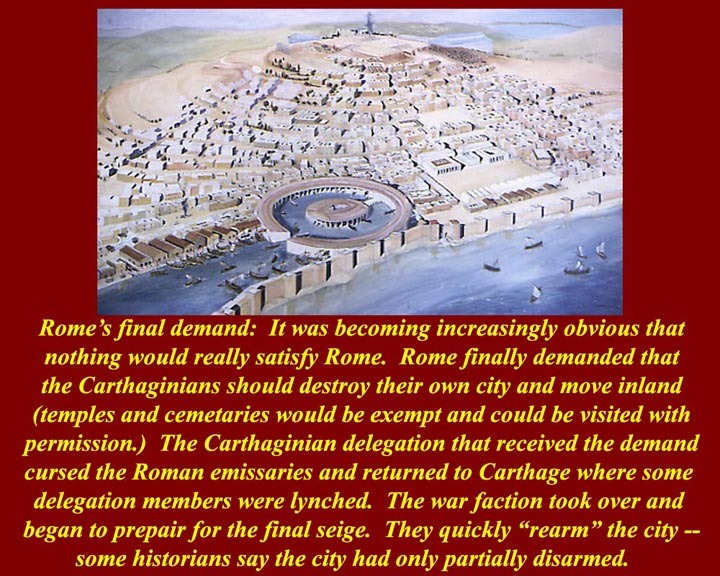 The Carthaginian negotiators refused to agree to the self-destruction of Carthage. They cusrsed the Romans and accurately predicted that they (negotiators) would face a lynch mob when the made known the latest Roman demand. 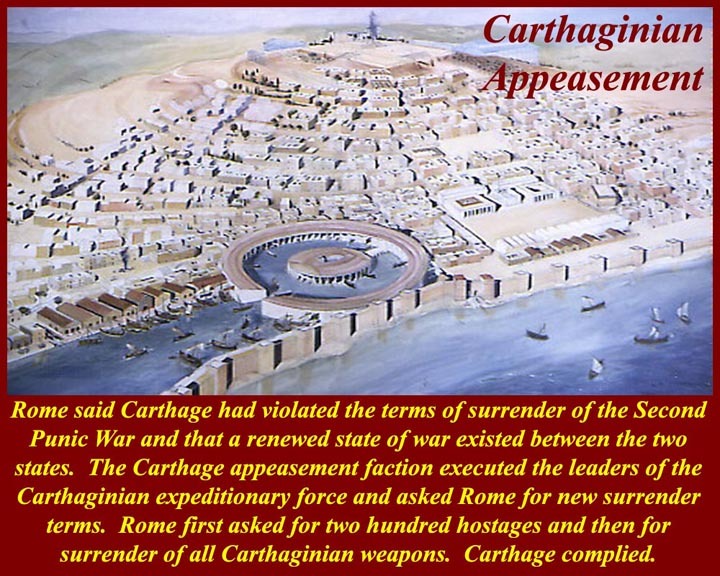 Both Consular armies besieged Carthage, but several attempts to take the supposedly disarmed city were repulsed by well-armed loca militias. Appian records that thee defenders quickly made new weapons, but at minimum that meant that they had a great deal of military raw materials (mostly metals) in addition to the arms they had actually surrendered. 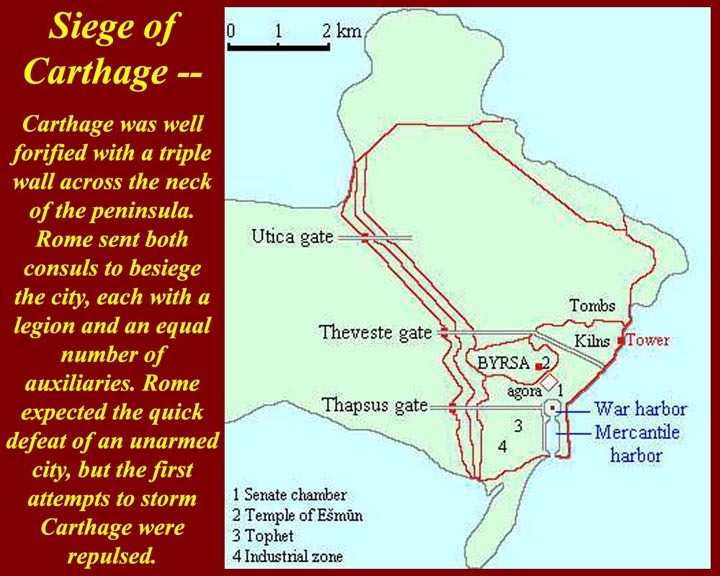 The Consuls built camps on the neck of land separating Carthage from the hinterland and constructed two massive battering rams (each "operated by 6000 men" -- perhaps an exageration). 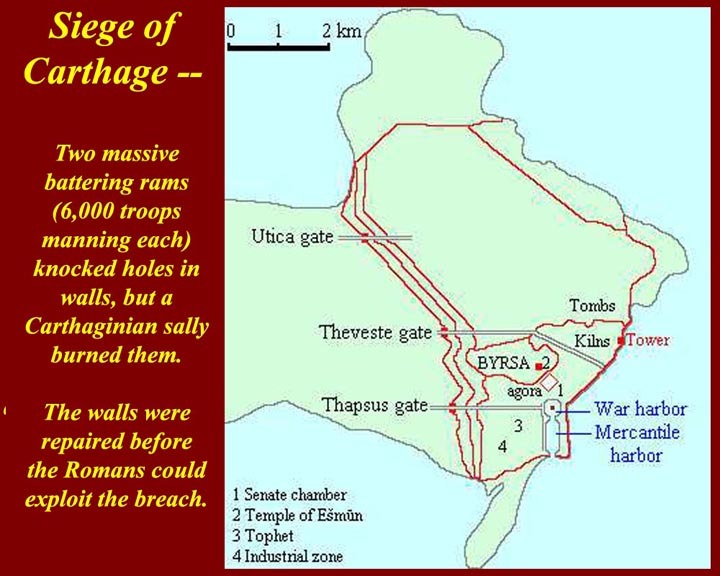 Holes were punched in the walls, but Roman troops could not flow through. Defenders sortied out and burned the machines. 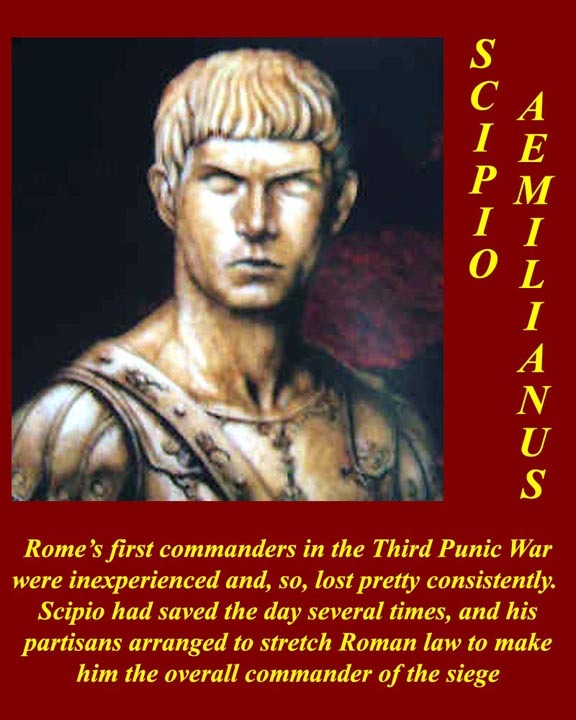 Through maneuvering back in Rome, Scipio Aemilianus was elected Consul for 147 BC and given command of the expeditionary force. He had earlier distinguished himself on several occasions by rescuing Roman troops that had been unwisely hazarded. built a new port entrance and a new fleet with which to attack the Roman sea blockade. 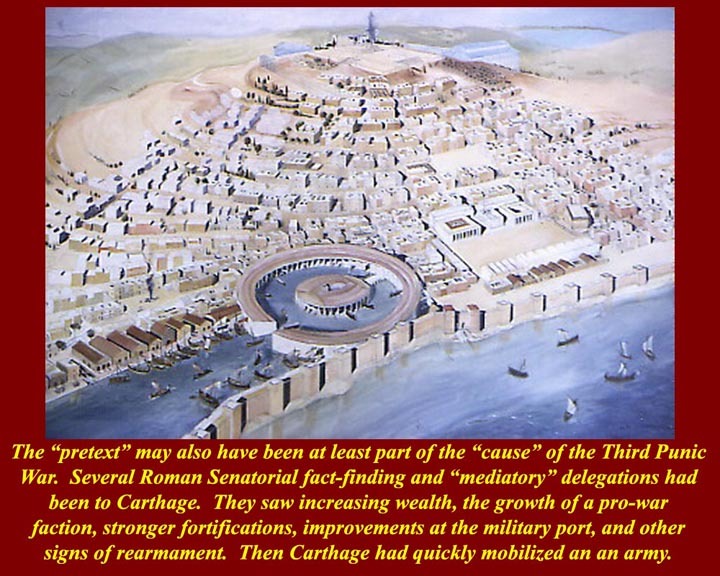 The Carthaginan fleet was defeated, but, once again, Roman claims that Carthage was ready to fight were justified -- we know, and certainly the Romans knew, that ships were built of prefabricated parts, which Carthage had clearly held in reserve. 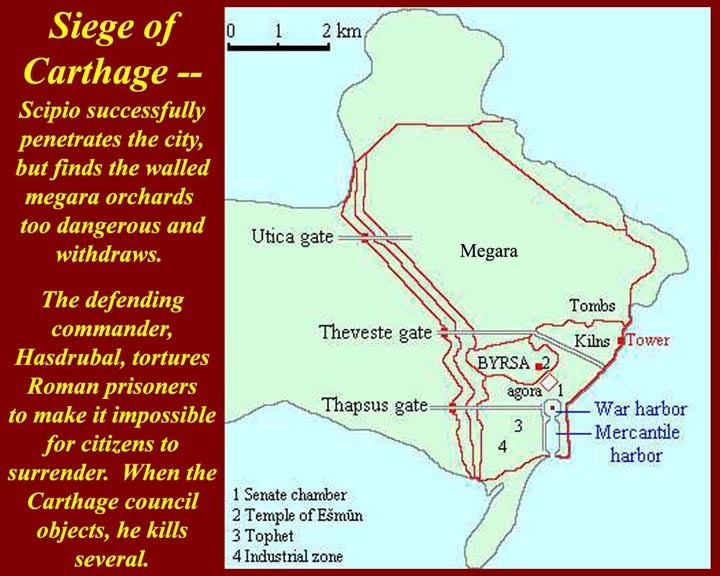 area of the City, the enraged Carthaginian commander, Hasdrubal, brutally tortured and killed Roman prisoners on the city walls. Moderns historians think he did this to make surrender impossible by the Carthaginian anti war faction. When the city governing council objected, Hasdrubal executed several members. 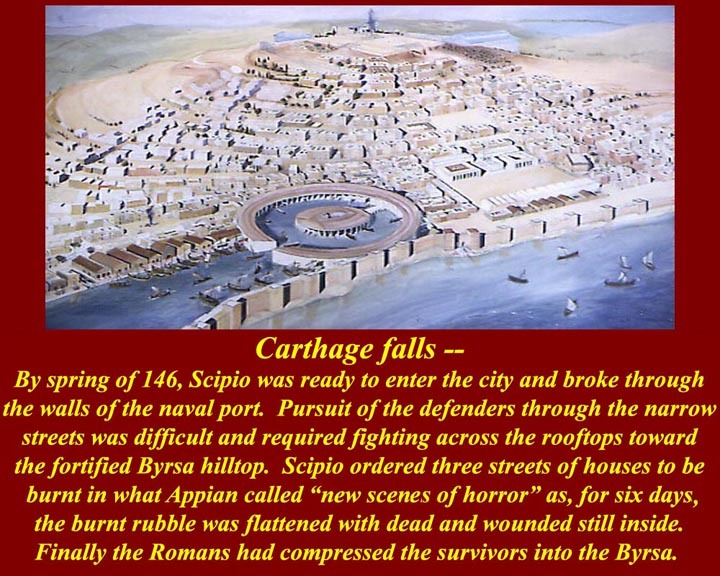 In spring of 146 BC, Scipios forces breached the walls of the circular naval port and began its six day march up to th Byrsa Hill. Narrow streets made progress difficult, and troops had to move from house to hous along rooftops. 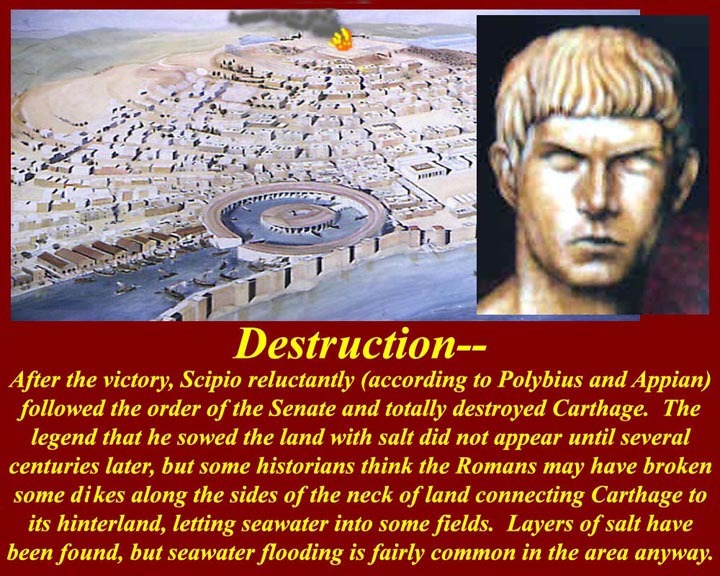 Scipio finally burned down three adjacent streets and then advanced up the hill buryiing dead and wounded Carthaginians in the flattened rubble. The whole remaining population of the city fled to the Byrsa. 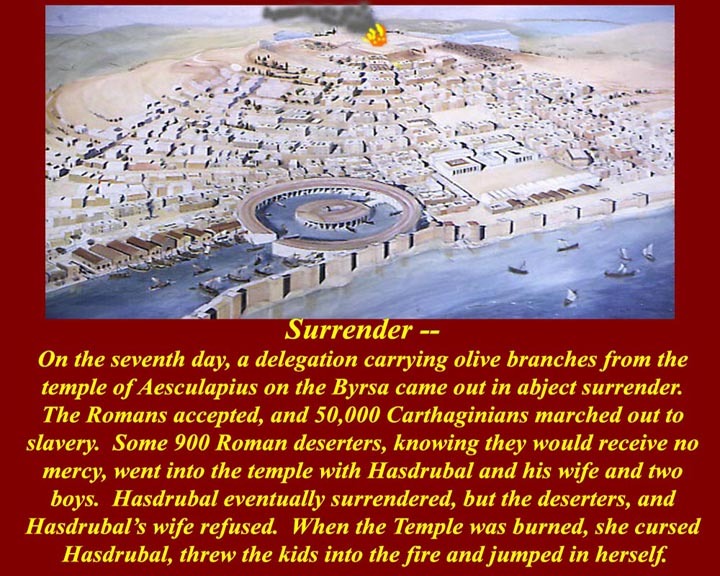 On the seventh day, 50,000 Carthaginians surrendered carrying olive branches from the Temple of Aesculapius on the Byrsa Hill. They were sold into slavery. Hasdrubal and his wife and two young sons held out in the temple along with about 500 Roman army deserters who knew they would face instant execution. After a while, Hasdrubal surrendered but his wife refused and cursed him for a coward. The Romans fired the temple, and the iwife threw her children into the flames and leapt in after them. The deserterd retreated to the temple roof where they too were consumed. 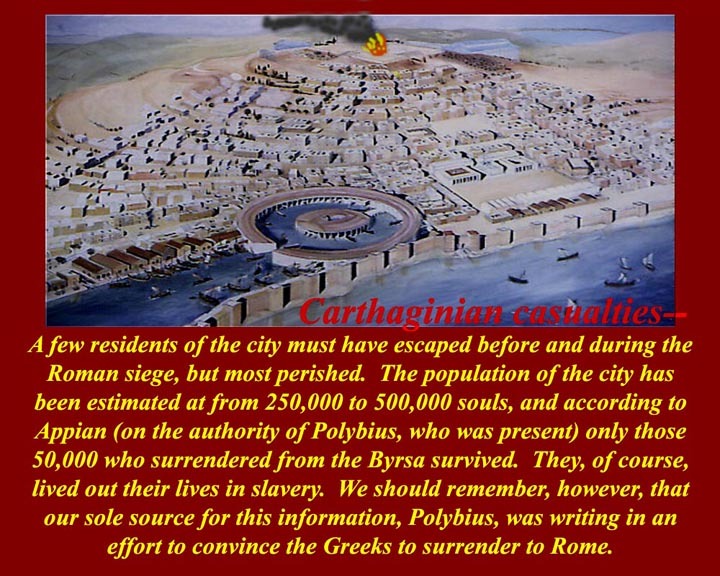 It's impossible to know how many Carthaginians were in the city at the beginning of the siege, but it's clear the Carthaginian civilian death toll was very high. Estimates of the total population of the city and suburbs in peacetime go as high as 700,000 (although that's probably a gross exaggeration). 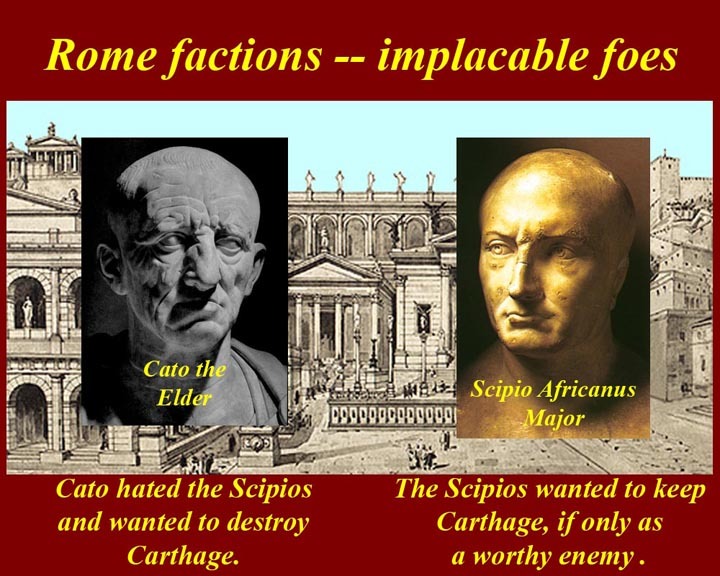 Scipio, according to Polybius and Appian, reluctantly carried out the orders of the Roman Senate to destroy the city -- he is said to have recited an Homeric couplet about the fall of Troy, supposedly to show his feeling that all empires eventually fall. 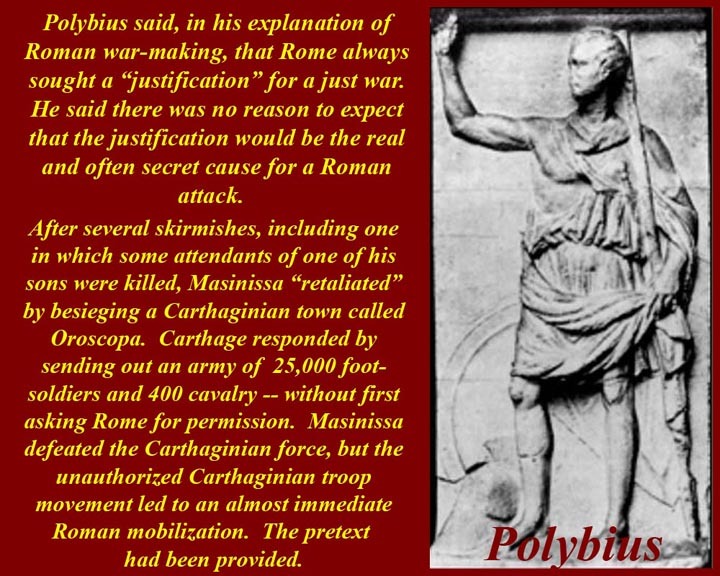 Appian says that Polybius war at Scipio's side when Scipio said the words. Carthaginian ruins are still on the side of the Byrsa Hill. 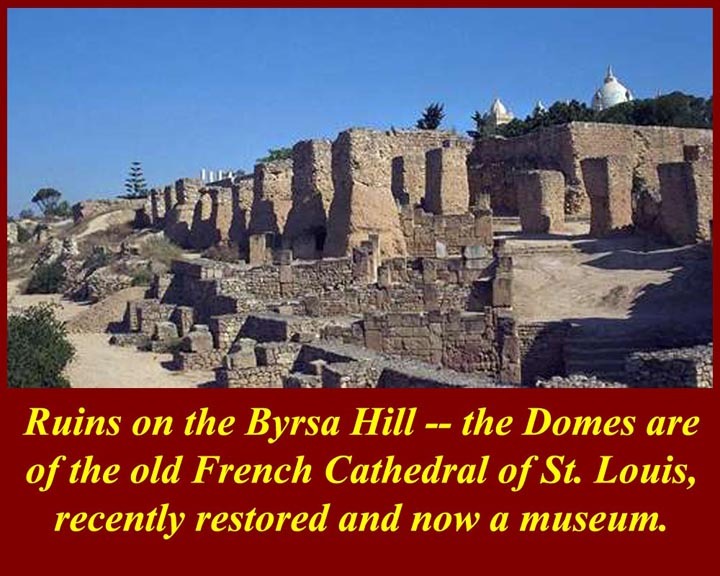 The Romans burned the hilltop temple and later flattened the hill itself for later construction. An recently restored but desacralized 1890 French Basilica of St. Louis stands on the site now and is used for concerts and cultural events. 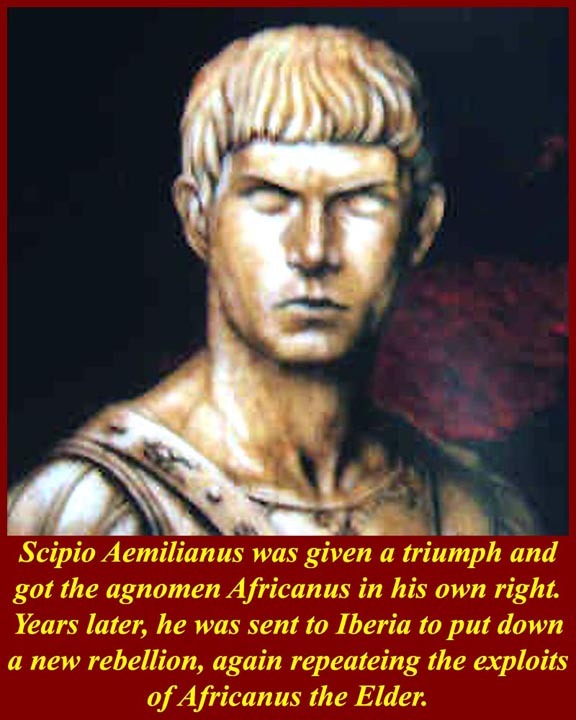 Scipio Aemilianus quickly was granted a victor's triumph in Rome and was awarded the agnomen Africanus in his own right. 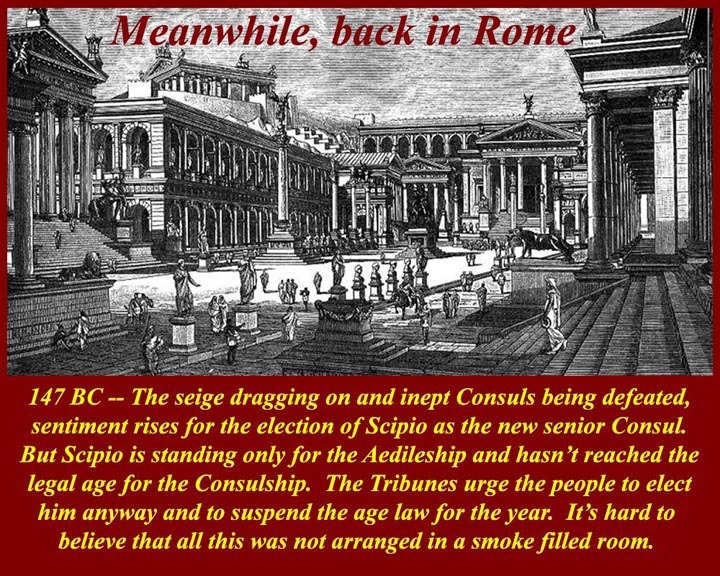 The decease earlier Africanus was thereafter know as "the Elder" while Aemilianus was designated "the Younger." His services were required again several years later in Iberia where his conquests became the two additional new provinces of "closer" and "farther" Hispania. 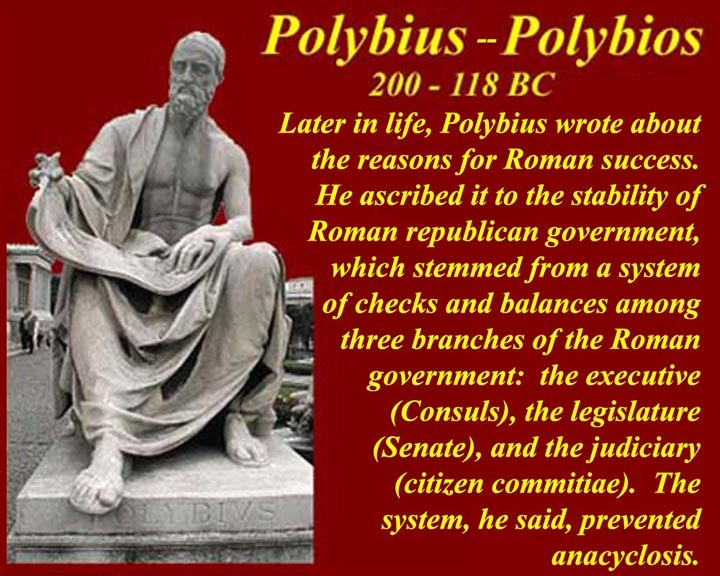 Polybius went on to write his history of Roam conquests up to his time. 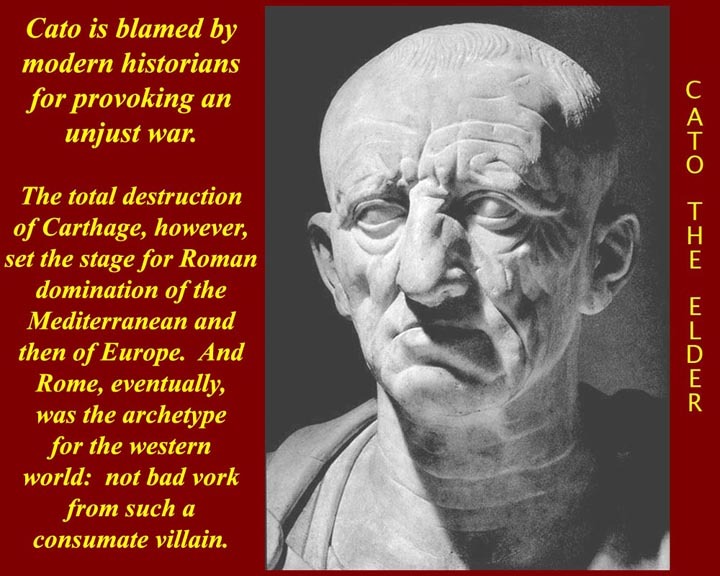 His history included an explanation for his Greek audience of why the stability of Rome's tripartite Republican government made Rome invincible. He might have thought otherwise one hundred years later then the real conquests began sans republic. 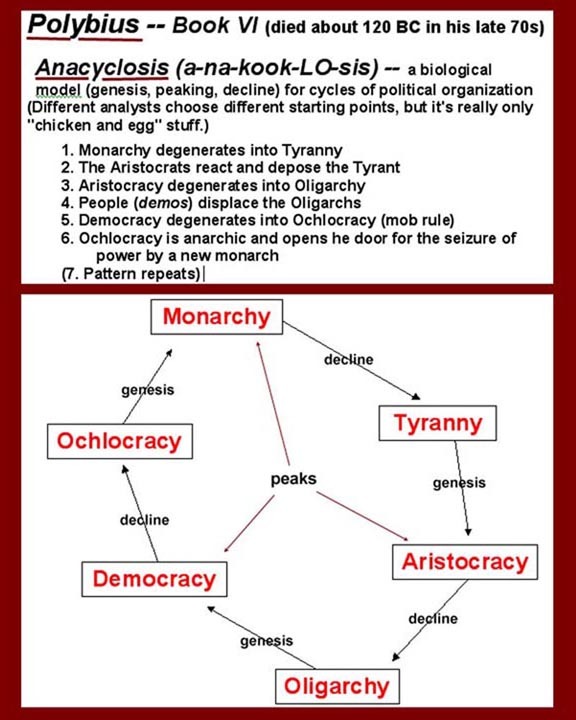 Polybius said anacyclosis (see image) was an inevitable cycle in which mob democracy led to mob rule followed by monarchy, tyranny, aristocracy, plutocracy, the again to democracy, etc., in a never ending circular progression. 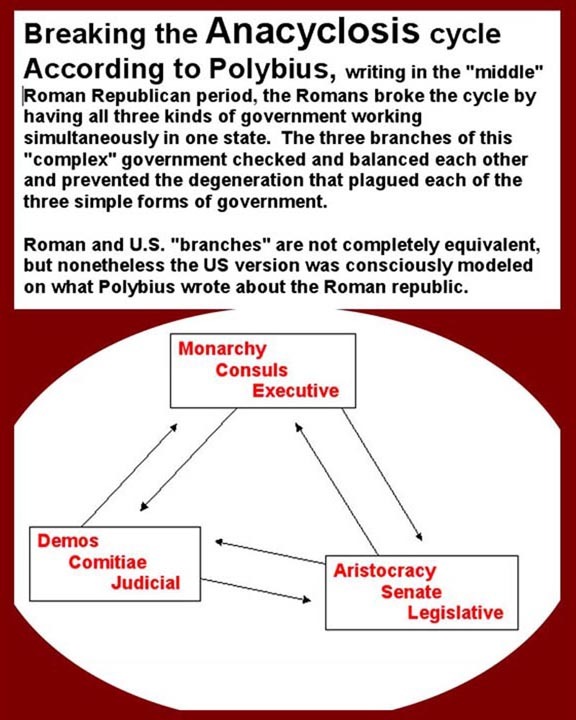 The Roman Republic, according to Polybius, had figured uot how to avoid the three bad parts of anacyclosis -- mob rule, tyranny, and oligarchy -- by similtaneously having a monarchichal executive branch (actually a duarchy, two co-equal Consuls), an aristocratic legislature (Senate), and a democratic civil court system (the public Comitiae). The three branches naturally checked and balanced each other. If that sounds familiar, it's because the framers of the US Constitution had multiple copies of Polybius at the Constitutional Convention of 1789, thoughtfully provided by Jefferson who was, at the time, the US ambassador in Paris. 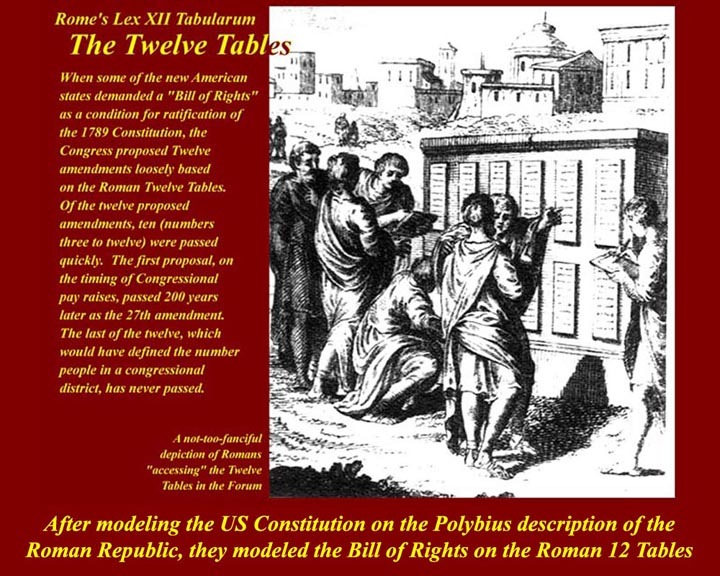 Later, the American "Founding Fathers" also emulated the Roman "Twelve Tables" when they pusued and adopted the American Bill of Rights -- there were originally to be twelve amendments in the Bill of Rights but only ten were agreed upon. An eleventh later became the 27th Amendment, and the twelfth never passed. 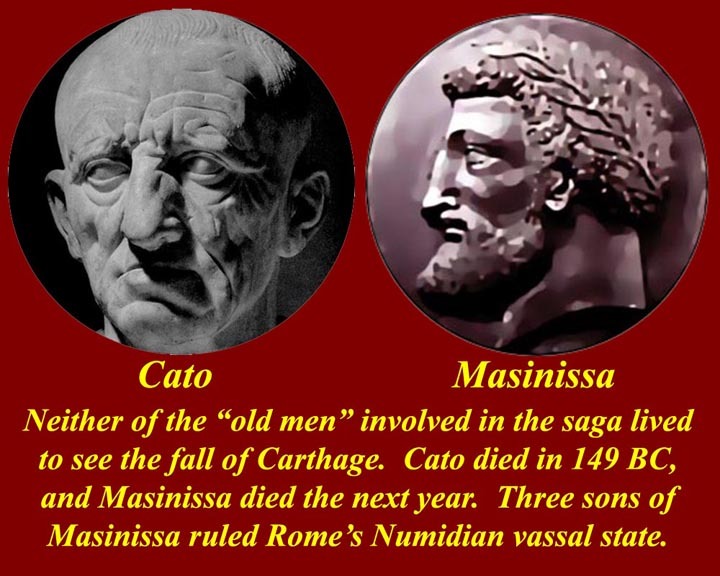 Niether Cato nor Masinissa, the two "old men" involved in the saga, lived through the 3rd Punic War. 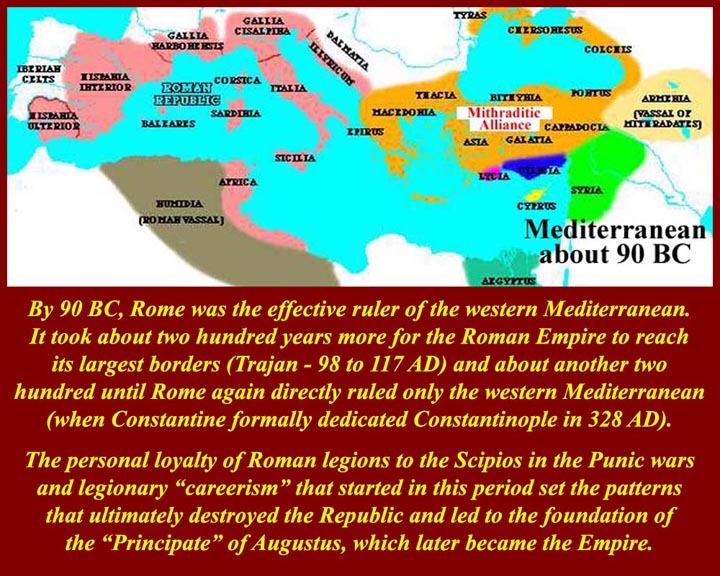 By 90 AD, Rome had control of the western Mediterranean. Roman North Africa -- the subject of the next unit.